Improving the Performances of the nMPRA Processor using a Custom Interrupt Management Scheduling Policy, ZAGAN, I., GAITAN, V. G.
Design of an Adaptive Fuzzy Control System for Dual Star Induction Motor Drives, YOUB, L., BELKACEM, S., NACERI, F., CERNAT, M., PESQUER, L. G.
SCHIPOR, O.-A. , WU, W. , TSAI, W.-T. , VATAVU, R.-D.
We introduce in this work a new software architecture design, based on well-established web communication protocols and scripting languages, for implementing spatially-indexed media in smart environments. We based our approach on specific design guidelines. Our concept of spatially-indexed media enables users to readily instantiate mappings between digital content and specific regions of the physical space. We present an implementation of the architecture using a motion capture system, a large visualization display, and several smart devices. We also present an experimental evaluation of our new software architecture by reporting response times function of changes in the complexity of physical-digital environment. Zhanpeng H., Weikai L., Pan H. (2015), Ubii: Towards Seamless Interaction between Digital and Physical Worlds, MM '15 Proceedings of the 23rd ACM international conference on Multimedia, pp. 341-350, Brisbane, Australia. Goble M., (2010), Managing the gap between the physical and digital world through a balance between transparent and performative interaction, Thesis project, Malmö Högskola University. Rohs M., (2007), Map navigation with mobile devices: virtual versus physical movement with and without visual context, ICMI '07 Proceedings of the 9th international conference on Multimodal interfaces, pp. 146-153, Nagoya, Aichi, Japan. H. Ishii, B Ullmer (1997), Tangible Bits: Towards Seamless Interfaces between People, Bits, and Atoms, Proceedings of the SIGCHI Conference. Hiroshi Ishii (2008), Tangible Bits: Beyond Pixels, Proceedings of the Second International Conference on Tangible and Embedded Interaction. Ishii I., Lakatos D., Bonanni L.. and Labrune J.B., (2012), Radical Atoms: Beyond Tangible Bits, Toward Transformable Materials, Intercations, XIX.1. A. Elliott, B Peiris, C Parnin (2015), Virtual reality in software engineering: Affordances, applications, and challenges, IEEE/ACM 37th IEEE International Conference on Software Engineering, 547-550. M. Billinghurst, A Clark, G Lee (2015), A survey of augmented reality, Trends in Human-Computer Interaction, vol. 8: No. 2-3, pp 73-272. Weiser, M.; Gold, R.; Brown, J. S. Origins of ubiquitous computing research at PARC in the late 1980's. IBM Systems Journal. 1999; 38 (4): 693-696. Cook, Diane; Das, Sajal (2005). Smart Environments: Technology, Protocols and Applications. Wiley-Interscience. ISBN 0-471-54448-5. Das, S.K. : Designing Smart Environments: Challenges, Solutions and Future Directions. In: Proceedings of ruSMART conference, St. Petersburg, Russia (2008). Korzun D. G., Balandin S., and Gurtov A. (2013), Deployment of Smart Spaces in Internet of Things: Overview of the Design Challenges, The 6th Conference on Internet of Things and Smart Spaces (ruSMART), At St. Petersburg, Russia. Gardner, Michael and Elliott, Jennifer (2014), The Immersive Education Laboratory: understanding affordances, structuring experiences, and creating constructivist, collaborative processes, in mixed-reality smart environments. EAI Endorsed Transactions on Future Intelligent Educational Environments, 14 (1). Carrington, P., Hurst, A., Kane, S.K. 2014. Wearables and chairables: inclusive design of mobile input and output techniques for power wheelchair users. In Proceedings of the SIGCHI Conference on Human Factors in Computing Systems (CHI '14). ACM, New York, NY, USA, 3103-3112. Kane, S.K., Frey, B., Wobbrock, J.O. 2013. Access lens: a gesture-based screen reader for real-world documents. In Proceedings of the SIGCHI Conference on Human Factors in Computing Systems (CHI '13). ACM, New York, NY, USA, 347-350. Garzotto F., et al. 2016. Monitoring and Adaptation in Smart Spaces for Disabled Children. In Proceedings of the International Working Conference on Advanced Visual Interfaces (AVI '16), ACM, New York, USA. Agosta G. (2015), Playful Supervised Smart Spaces (P3S) - A Framework for Designing, Implementing and Deploying Multisensory Play Experiences for Children with Special Needs, Digital System Design (DSD). Liu L. et al (2016), Smart homes and home health monitoring technologies for older adults: A systematic review, International Journal of Medical Informatics, Volume 91, Pages 4459. Geman O. et al (2015), Challenges and trends in Ambient Assisted Living and intelligent tools for disabled and elderly people, Computational Intelligence for Multimedia Understanding (IWCIM). Gilman E. et al, 2013, Towards interactive smart spaces, Journal of Ambient Intelligence and Smart Environments - Context Awareness archive, vol. 5 (1), pp 5-22. Korzun D. et al (2014), Virtual shared workspace for smart spaces and M3-based case study, 15th FRUCT conference, Saint-Petersburg, Russia. Amato A., Martinio B, Venticinque S. (2012), Semantic brokering of multimedia contents for smart delivery of ubiquitous services in pervasive environments, IJIMAI, vol 1(7), pp 16-25. Lee J.W. et al (2015), Persim 3D: Context-Driven Simulation and Modeling of Human Activities in Smart Spaces, IEEE Transactions on Automation Science and Engineering, vol. 12(4), pp. 1243-1256. Vatavu R-D (2012) Point & click mediated interactions for large home entertainment displays. Multimed Tools Appl 59(1):113-128. Kollee B., Kratz S., and Dunnigan A. 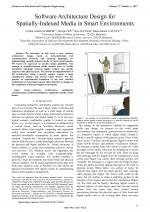 (2014) Exploring gestural interaction in smart spaces using head mounted devices with ego-centric sensing, Proceedings of the 2nd ACM symposium on Spatial user interaction (SUI '14). ACM, New York, NY, USA, 40-49. Matassa A., Cena F. (2015) Body experience in the ubiquitous era: towards a new gestural corpus for smart spaces, Proceedings of the 2015 ACM International Joint Conference on Pervasive and Ubiquitous Computing and Proceedings of the 2015 ACM International Symposium on Wearable Computers, ACM, New York, USA, 945-950. Vatavu, Radu-Daniel. (2013). A Comparative Study of User-Defined Handheld vs. Freehand Gestures for Home Entertainment Environments. Journal of Ambient Intelligence and Smart Environments, 5(2). IOS Press, 187-211. Vatavu, Radu-Daniel, Chera, Catalin Marian, Tsai, Wei-Tek. (2012). Gesture Profile for Web Services: An Event-driven Architecture to Support Gestural Interfaces for Smart Environments. In Proceedings of AmI'12, the International Joint Conference on Ambient Intelligence (Pisa, Italy, Nov. 2012). LNAI 7683, Springer-Verlag Berlin Heidelberg, 161-176. Yihua Lou, Wenjun Wu, Radu-Daniel Vatavu, Wei-Tek Tsai. (2017). Personalized Gesture Interactions for Cyber-Physical Smart-Home Environments. Science China Information Sciences 60 (7). Science China Press & Springer. Vatavu, R.D. (2017). Smart-Pockets: Body-Deictic Gestures for Fast Access to Personal Data during Ambient Interactions. 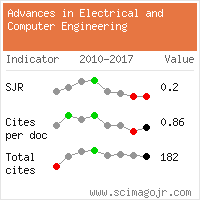 International Journal of HumanComputer Studies. van Seghbroeck, G., Verstichel, S., de Turck, F., Dhoedt, B.: WS-Gesture, a gesture-based state-aware control framework. (2010). In Proceedings of the IEEE International Conference on Service-Oriented Computing and Applications, SOCA 2010 (2010). Citations for references updated on 2019-04-20 05:04 in 222 seconds. Website conception, design and maintenance by Eugen COCA. Content updated on 28 Feb 2019. Site engine updated on 28 Feb 2019. This page was generated on the server in 0.053 seconds and loaded in your browser in > seconds.